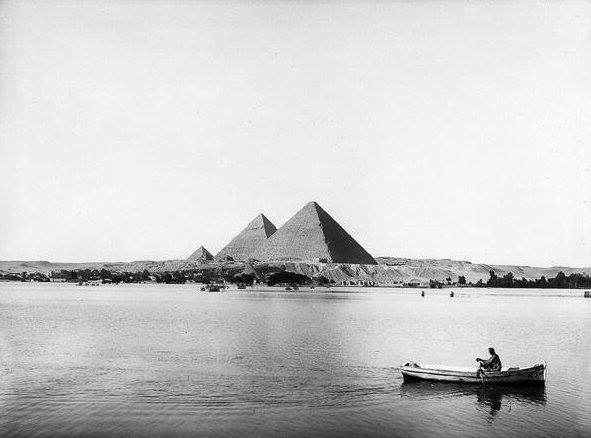 The Nile by the Giza Pyramids, Egypt, 1927. T would like to go to Egypt,and see the pyramids up close .I’ve seen them in pictures,but I would like to stand next to them and see the enormity of them. I went to Egypt in 2011. I would definitely urge you to plan for that trip. This was number one on my bucket list and I would definitely go back. The pyramids and temples are amazing and archaeologists are still discovering something new daily. Also, just learning about very strong women as leaders was inspiring. I webt to Egypt in 2008. I was terribly disappointed with the pyramids. There was trash blowing across the area in front of the pyramids — stuff like paper and plastic bags. There were kids, who should have been in school I would think, selling 5 postcards for a dollar. And, we were surprised at how close the pyramids were to the city of Cairo. There were armed guards everywhere. And everyone had a hand out for money. If you took a picture with a soldier, he was expecting a tip, for heaven’s sake! We had an armed guard on our tour bus, and when we were at the pyramids, he kind of took us under his wing and showed us the ropes. For example, we were told not to take the camel rides being offered at the pyramids. What the camel operators would do is sell you a camel ride for, let’s say, $20. At the end of the ride, they would say, “Oh, you want to get down off the camel? That will be $100.” And you were stuck on the camel until you coughed up some more money. Our armed guard even took our pictures for us–so we could both be in them. I recommend not going to see the pyramids — if you have high expectations for what you’ll see there. I am glad I got to see them after years of looking at photos of them in our National Geographic magazines, but I would have preferred to have been left with that impression of them. We were on a Mediterranean cruise at the time we went there, and even though we had an overnight in Alexandria, we did not get off the ship the second day. They had their first bombing in Cairo in three years while we were ther, and the ship’s captain said not to worry and that the bombing had happened 25 kilometers from where the shore excursions were operating, but that is like the distance from our house to our good friend’s house. It was too close for our comfort. We were parked next to a U.S. naval vessel, so we felt good about that.